Eleanor Nordyke displays photostats of her twin daughters' birth certificates (Courtesy Honolulu Advertiser)Images of two 1961 Hawaii birth certificates similar to the one President Obama purportedly has on file have now been unveiled. The Nordykes' certificates include information missing from the short-form document for Obama published online, including the name of the hospital, the name of the attending physician, name and address of the parents, the race of the parents and the race of the baby. As WND reported yesterday, Hawaii's director of health responded to the growing controversy over the White House's refusal to release Obama's original long-form birth certificate by issuing a statement about the document in apparent contravention of Hawaiian law. Dr. Chiyome Fukino declared she has seen the "original birth records" that verify Obama was born in Hawaii and is a "natural-born American citizen," the Honolulu Advertiser reported. But in two separate telephone interviews with WND, Janice Okubo, the health department's public information officer, told WND that Hawaii law prohibited her from commenting on the birth records of any specific person. WND also reported the Hawaii Department of Heath affirmed that no paper birth certificate records were destroyed when the department moved to electronic record-keeping in 2001. The statement to WND by Janice Okubo, public information officer for state's health department, contradicted CNN U.S. President Jon Klein, who ordered host Lou Dobbs to quit discussing Obama's birth certificate on the air. Klein insisted the issue was "dead" because Obama's original long-form birth certificate had been destroyed by the Hawaii DOH in the conversion to electronic files. A close examination of the birth certificates issued by Kapi'olani to the Nordyke twins shows the registration number precedes the number given Obama, even though the future president was born a day earlier. 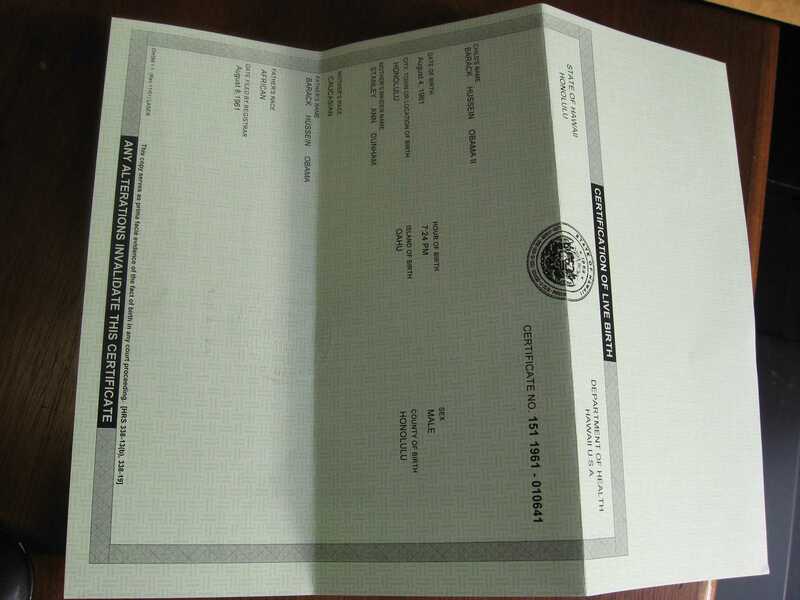 According to a version of Obama's purported short-form certificate available from FactCheck.org, Obama was given a higher registration number than the Nordyke twins. The online image indicates the number is No. 151 – 1961 – 10641, even though he was born Aug. 4, 1961, the day before the twins, and his birth was registered with the Hawaii registrar three days earlier, Aug. 8, 1961. The middle figure in Obama's purported registration also is different than the Nordykes'. Obama's is 1961, indicating the year, while the Nordykes' is merely 61. Another possibility is that Obama's number is not a genuine registration number created in 1961 but was issued when the short-form document was generated during the 2008 presidential campaign. Eleanor Nordyke told WND she thinks her twins got lower numbers because she went into the hospital Aug. 4, 1961, and was in labor for 20 hours before she delivered. She speculates that Ann Dunham came in after her and was given a later number, even though Dunham's baby was born earlier. Nordyke's twins were not born until the afternoon of the next day. WND was unable to receive a response from Hawaii officials regarding the state's procedure for issuing registration numbers. Meanwhile, an image of an apparently fraudulent Kenyan certificate of birth circulated on the Web today from an unknown source. It alleged Obama was born in Mombasa. But a contributor at FreeRepublic.com debunked it, declaring "Busted!" He pointed out that the background text, in Dutch, explained, in a rough translation, "This is not a government document. This is political commentary." WASHINGTON – WND Editor Joseph Farah has produced the first major DVD documentary on the critical issues surrounding the constitutional eligibility of Barack Obama to serve as president – but it wasn't easy. In fact, during the course of shooting and editing "A Question of Eligibility," the award-winning filmmaking team, including veterans of many controversial movie , made the unusual request to keep its identity secret for fear of retribution from the . "That's how hot this topic is," said Farah. "That's how hot this movie is." "Obama is choreographing a top-down revolution in America – one from which it may take generations to extricate ourselves," says Farah. "It will be a shame if we learn he was ineligible to serve in the office of president only after he's gone. If we can force the issue to be addressed while he is still in office, we have a chance of turning back the on many of the destructive actions he has taken already. If he's not able to prove his constitutional qualifications, we might all be able to wake up one day and think of the Obama administration as just a bad dream ." ...close examination of the birth certificates issued by Kapi'olani to the Nordyke twins shows the registration number precedes the number given Obama, even though the future president was born a day earlier. "Susan Nordyke was born at 2:12 p.m. Hawaii time and was given No. 151 – 61 – 10637, which was filed with the Hawaii registrar Aug. 11, 1961. "Gretchen Nordyke followed at 2:17 p.m. and was given No. 151 – 61 – 10638, which was also filed with the Hawaii registrar Aug. 11, 1961. "According to a version of Obama's purported short-form certificate available from FactCheck.org, Obama was given a higher registration number than the Nordyke twins. The online image indicates the number is No. 151 – 1961 – 10641, even though he was born Aug. 4, 1961, the day before the twins, and his birth was registered with the Hawaii registrar three days earlier, Aug. 8, 1961." "The middle figure in Obama's purported registration also is different than the Nordykes'. Obama's is 1961, indicating the year, while the Nordykes' is merely 61. "One explanation for the out-of-order serial numbers might be that several serialized stacks of birth certificates were made available at different hospitals. "Another possibility is that Obama's number is not a genuine registration number created in 1961 but was issued when the short-form document was generated during the 2008 presidential campaign."